The beauty of Evening Primrose Spring, which was stated by ranger Charles Phillips to be not inferior to Morning Glory Pool at its best time, was the reason for the Park Service to cut a trail to the center of Sylvan Springs Group in 1930. In the Ranger Naturalists Manual of Yellowstone National Park from 1927 Phillips wrote: "For sheer beauty the "Evening Primrose" would not suffer with comparison with Morning Glory. It is similar in size and form but a brilliant cadmium yellow with touches of crimson at the edges." Unfortunately, between the 1959 earthquake and 1971 Evening Primrose Spring gradually shifted from a vibrant yellow appearance to a murky yellow-brown consistence. This caused the interest in visiting the remote location to fade and the trail deteriorated to such an extent that it is now virtually unrecognizable. Meanwhile the Sylvan Springs Group is a true backcountry area and on a visit everybody for himself has to take care of his safety. 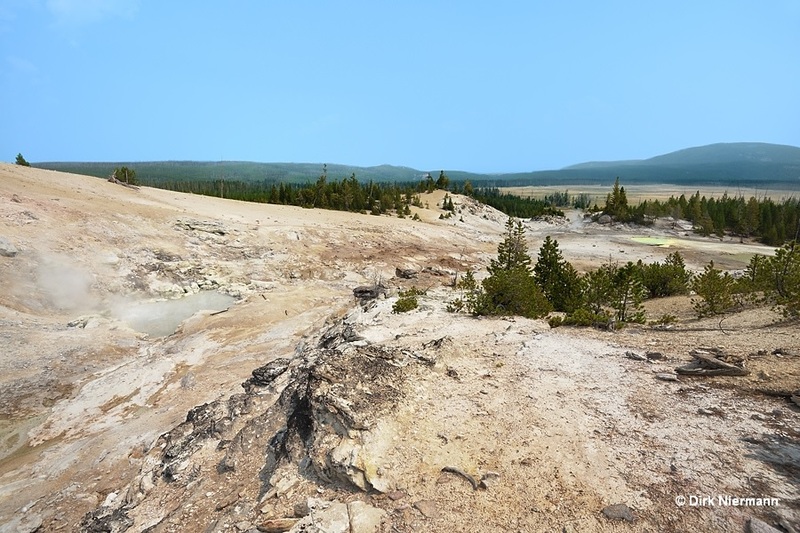 One possible route starts at the Monument Geyser Basin trailhead and branches off to the right just before the trail begins to climb the steep grade. This route provides the advantage that you don't have to wade through Gibbon River. For some hundred yards it follows the river on its west side through light forest, then it crosses a patchwork of dry and wet meadow areas, bushy sections, and ribbons of standing and fallen trees. Hikers who are ready to experience true wilderness will like it, others who feel uncomfortable if boots and socks get wet and muddy will not be so happy with it. As everywhere else in Yellowstone backcountry be prepared to come across wildlife, especially bison and bears, and take care accordingly. Particularly worth mentioning is the huge variety of wildflowers, such as different types of orchids, Indian paintbrush, fringed gentian, or harebell, both on wet and dry sections of the meadows. Our destination on this hike was the center of Sylvan Springs Group and the prominent features there, so we left out the southern subgroup with Bridge Spring, and we also did not plan to visit the extended northern section, where mostly less impressive springs are located. From the meadows a good access to the southern subgroup is not easy to detect because it is obscured by trees. In contrast, the center area is visible from time to time during the hike and can't be missed. 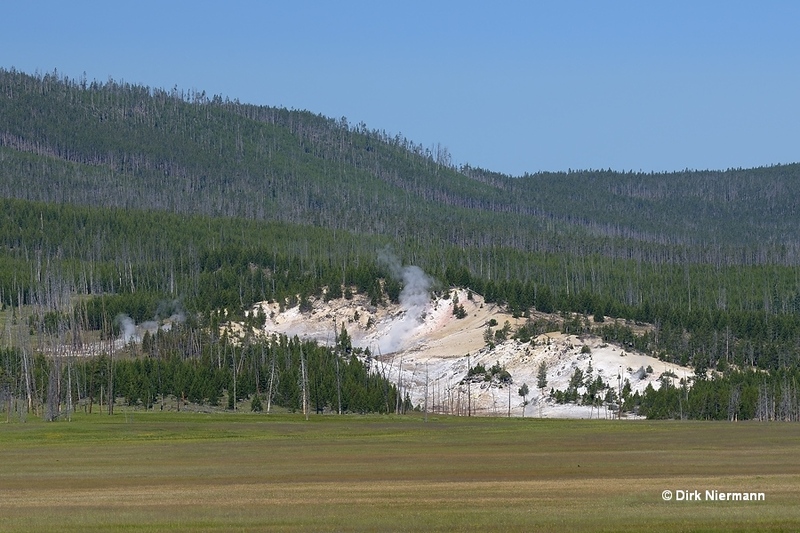 The hiking distance from the Monument Geyser Basin trailhead to the group's center is around 2.2 km (1.3 miles). We started our exploration tour in the southwest at the small spring GSSGNN020, still surrounded by trees and thus living up to the name sylvan spring. 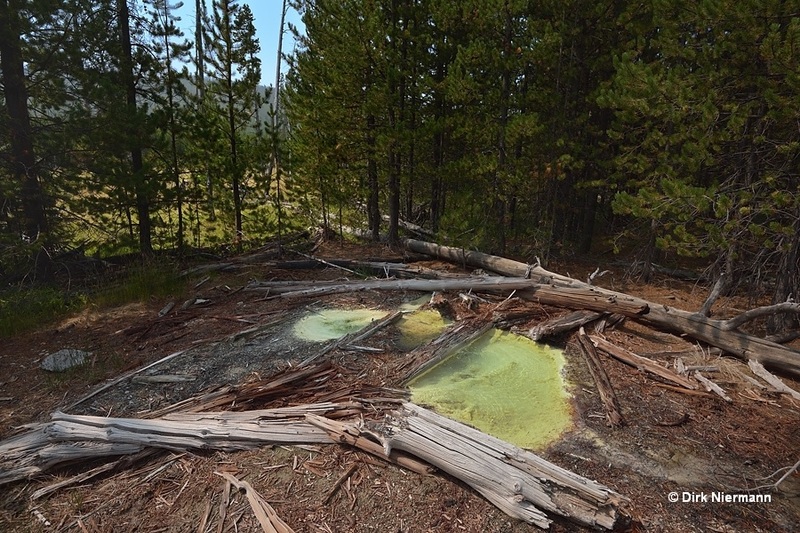 Its pronounced sulfur lining and lack of orange cyanobacteria indicate acidic conditions. 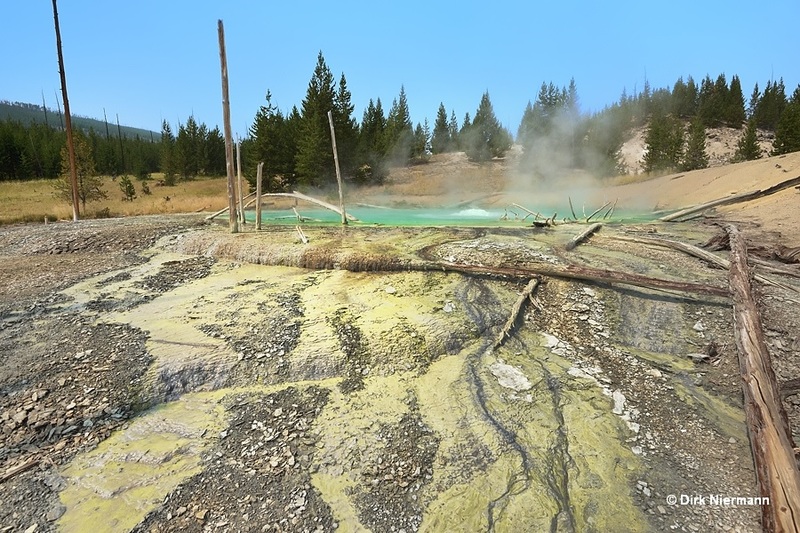 While GSSGNN020 lies a little bit apart, the large, sulfur lined and constantly bubbling blue pool named Dante's Inferno leads you to the core area. But what has a hot spring in Yellowstone to do with the medieval Italian poet Dante? After all, there is neither a hot spring nor a geyser mentioned in his literary work. Some believe that the name "Dante's Inferno" was originally meant for the entire, vaguely amphitheater shaped group, which would make sense with respect to the nine concentric, descending circles of hell in Dante's poem Inferno from the 14th century. Others have pointed out that the extensive, stepped terraces the spring builds up with its runoff stand for this very levels of hell. See Valle del Diavolo (Valley of the Devil) in Tuscany for the historical connection between geothermal areas and Dante. On the surface of Dante's Inferno water domes up every few seconds, sending out concentric, foaming waves almost over the entire pool. This is no effect of boiling since the temperature is only about 80 °C (176 °F), but of a mixture of rising steam and other gases. Just as remarkable, in particular for an acidic spring, are the terraces or terracettes in the widespread runoff area, exhibiting a pattern of delicate, partially sulfur coated scales on their horizontal surfaces. Even if the following picture looks like it was taken from a position inside the runoff, I actually stood on dry gravel at the edge of the terracettes. Dante's Inferno is still separated by a low ridge from the rest of the group. If you cross the ridge or go round it in eastern direction, you meet with the famous Evening Primrose Spring. Obviously, the eventful chemical and microbiological history of Evening Primrose Spring is only fragmentarily documented, as to be expected due to the remote location. 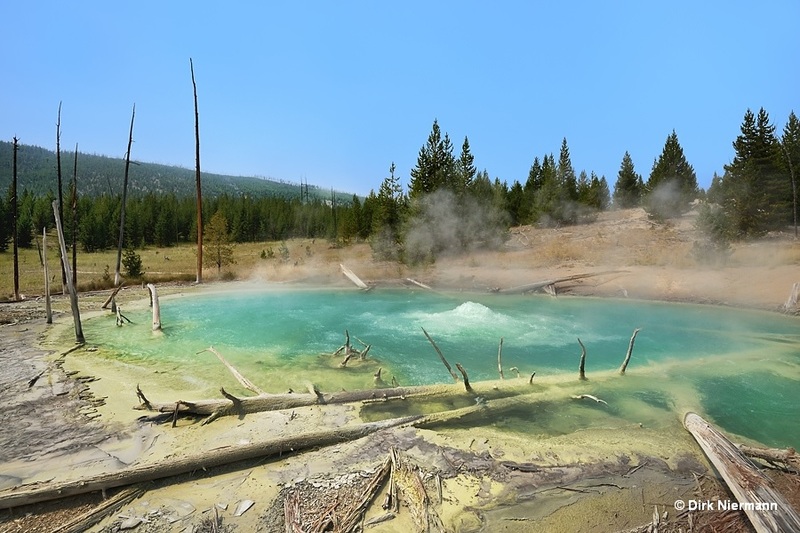 Around the beginning of the 20th century it was, according to the official Yellowstone Park website, a "deep crystalline spring similar to Morning Glory Pool". This implies that the spring must have been an alkaline pool near boiling temperature with transparent clear water of deep blue appearance. However, for this state the name "Evening Primrose" would not fit, and indeed it was attributed by the scientists Eugene T. Allen and Arthur L. Day not until 1930 (Allen and Day, Hot Springs of the Yellowstone National Park, 1935, p.401). 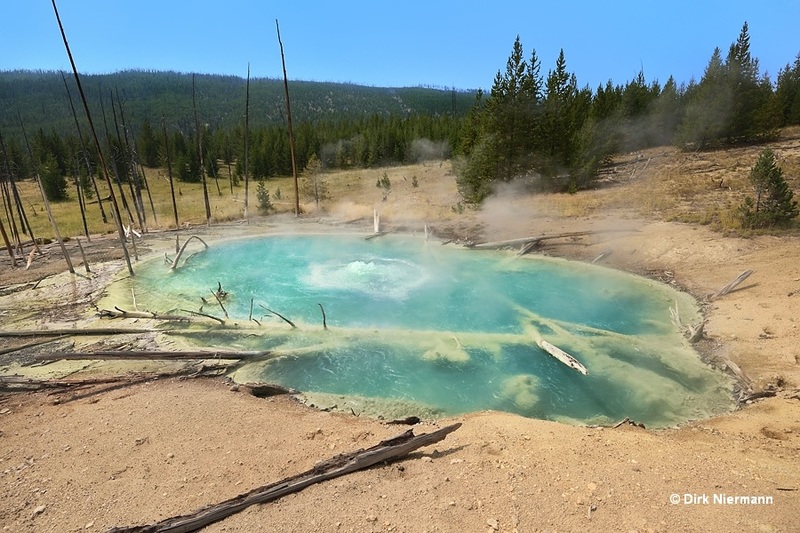 At some time between the turn of the century and 1930 an enrichment by finely dispersed sulfur must have taken place, which caused the appearance to turn from a blue spring with yellow rim into a vibrant yellow pool with a red hue of iron oxide around the edge. 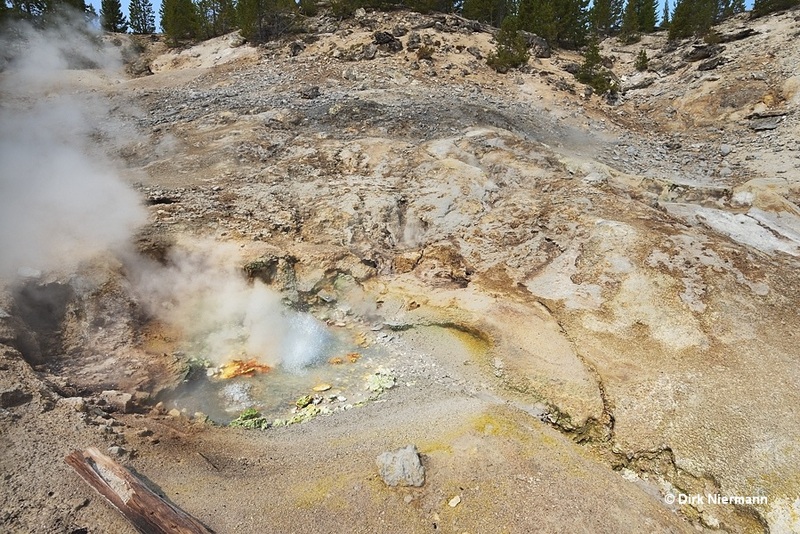 More recently, a similar sudden sulfur discharge into a formerly blue hot spring was observed with Crater Hills Geyser. For 1930 Allen and Day still reported alkaline water at an unexpectedly low temperature of 64 °C (147.2 °F) from Evening Primrose Spring, but sometime later it must have changed from alkaline to acidic conditions. 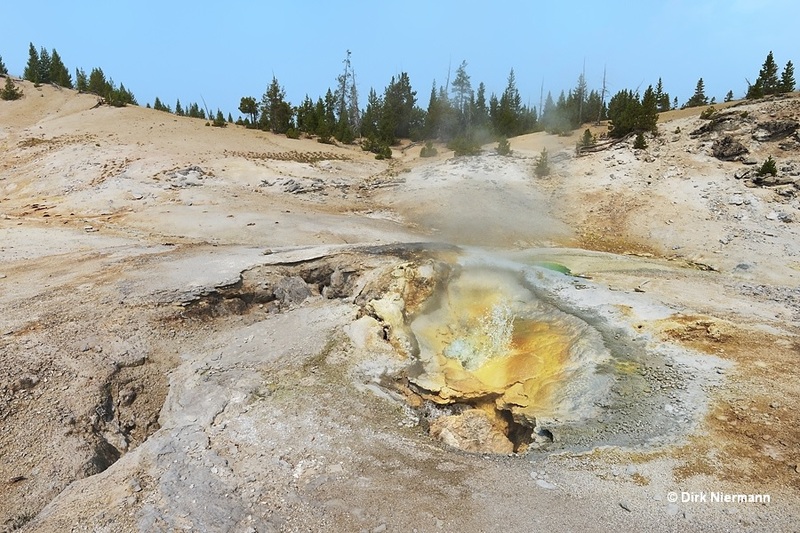 Beginning between 1959 and 1964, as recognizable on historical pictures in Yellowstone's Photo Collection, Evening Primrose Spring's surface got covered by thick, yellow-brown froth, consisting of almost pure sulfur. 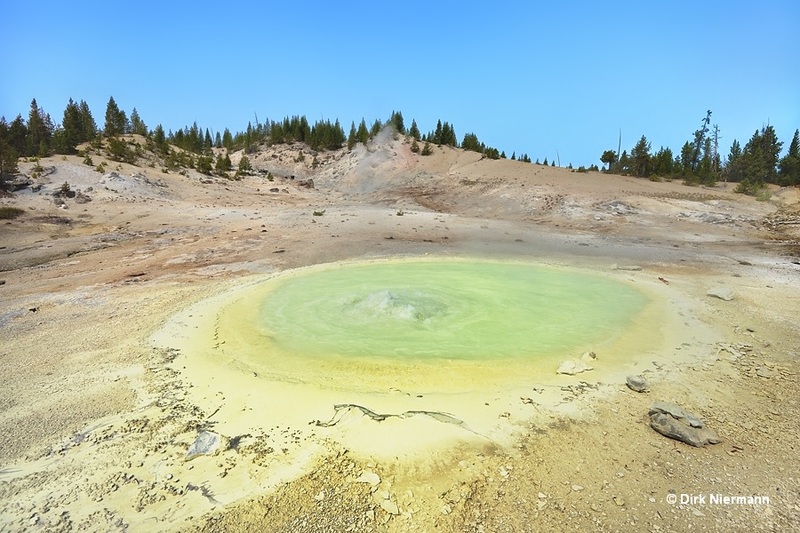 The next witnessed change occured between the summer of 1970 and the summer of 1971, when the temperature of the spring dropped from 90 °C (194 °F) to less than 80 °C (176 °F) and almost immediately an invasion of sulfur-oxidizing Sulfolobus archaea took place (see Thomas D. Brock, Thermophilic Microorganisms and Life at High Temperatures, Springer Verlag, 1978, p.316). 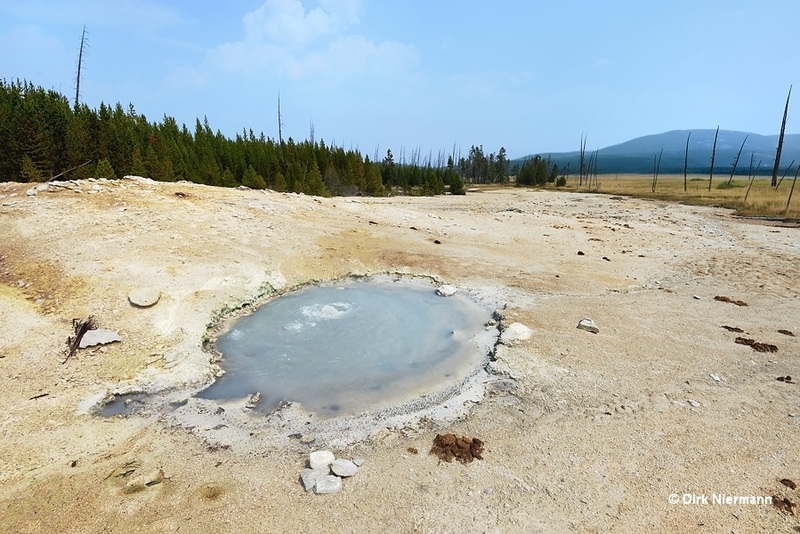 In this state the murky spring gave such a repulsive impression that some called it the ugliest pool of Yellowstone. The muddy brown cloudiness of the water continued at least until the year 2000, as documented by a picture in the RCN database. I found the earliest evidence for a noticeable recovery of Evening Primrose Spring from the Sulfolobus invasion for the year 2006, probably caused by a rise in temperature. Since then the roiling yellow-green water, encircled by an intensely yellow colored rim, offers an impressive sight again. However, the spring remains to be acidic. 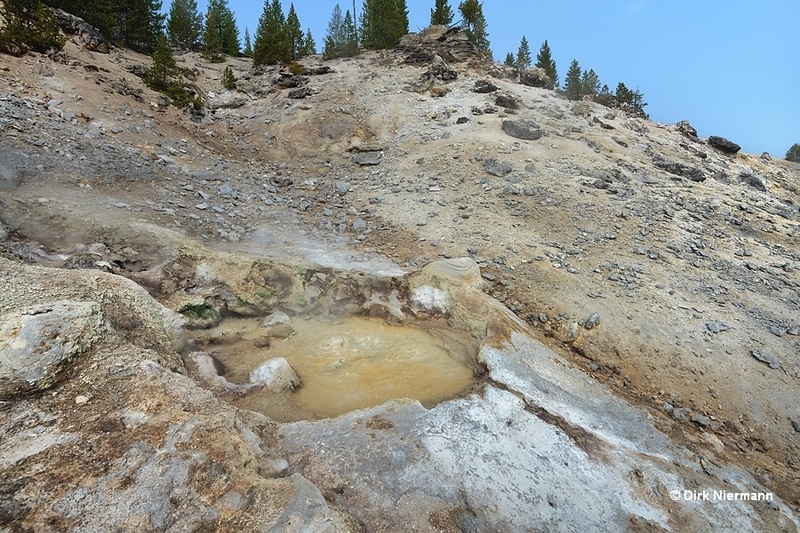 The similarities between Evening Primrose Spring and Crater Hills Geyser may not only be superficial, but there is considerable evidence that both features receive very hot, alkaline water from reservoirs in the depth, which mixes with acidic, sulfur rich, and somewhat cooler inflow from higher layers. Fluctuating supply of the different water types would explain both the sudden changes in water chemistry and in temperature. 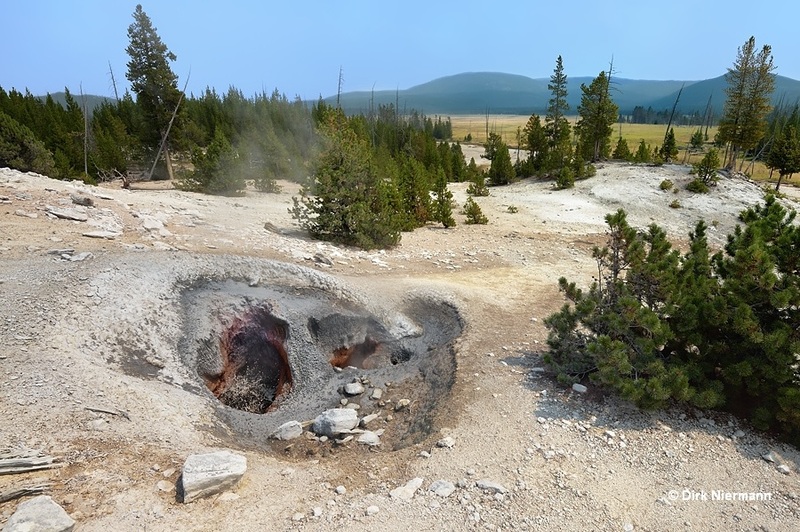 Anyway, besides geysers these natural "mixing bowls" are belonging to the most fascinating thermal features of Yellowstone and are always good for a surprise. On arrival at the center of the Sylvan Springs Group a large ravine with bare ground opens up, winding down the slope of a hill form southwest to northeast until it reaches the level of the Gibbon River meadows. The next photo shows an overview with Sylvan Spring on the left hand side and Evening Primrose Spring in background on the right hand side. Moving on from Evening Primrose Spring to further springs is not an easy procedure. It takes both a lot of time and a lot of care to reach positions which provide a sufficient look at single features. 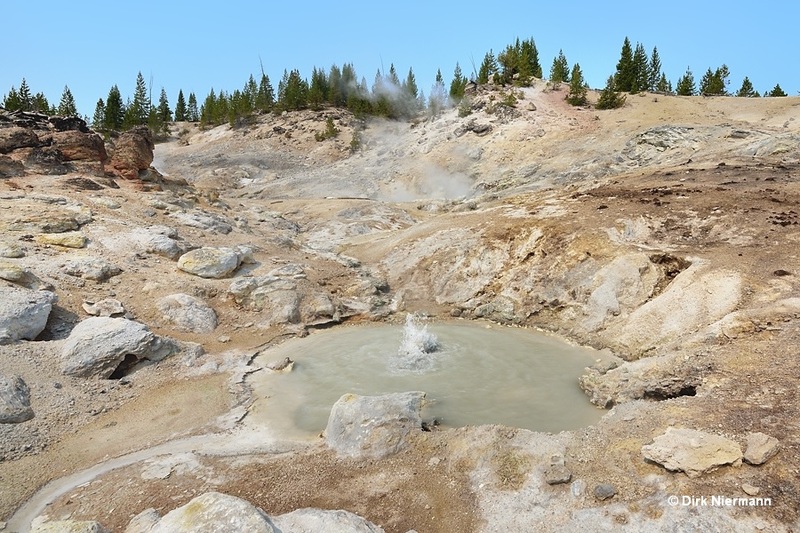 Since the stability of the ground in between the springs is unpredictable, one should move as much as possible along the outer edge of the thermal area. A few feet north of Evening Primrose Spring the perpetual spouter GSSGNN036 shows up. With its appealing cliff design and colorful bowl it somehow reminds of a (giant) tabletop water fountain. Immediately north of GSSNN036 the slightly opaque green pool GSSGNN037 adjoins. Heading west from GSSGNN037 upslope alongside the area with the highest activity, you first come across the muddy spouter GSSGNN045. 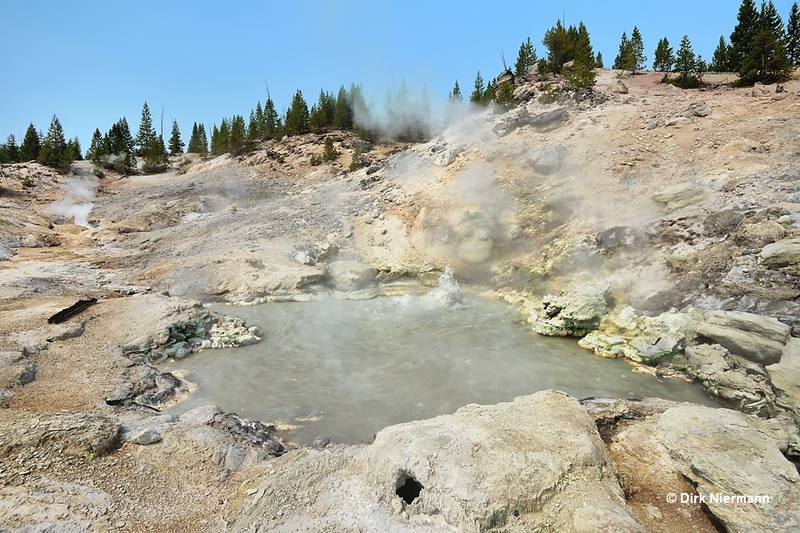 However, GSSGNN045 is only a premonition of the most vigorously spouting hot spring on location. 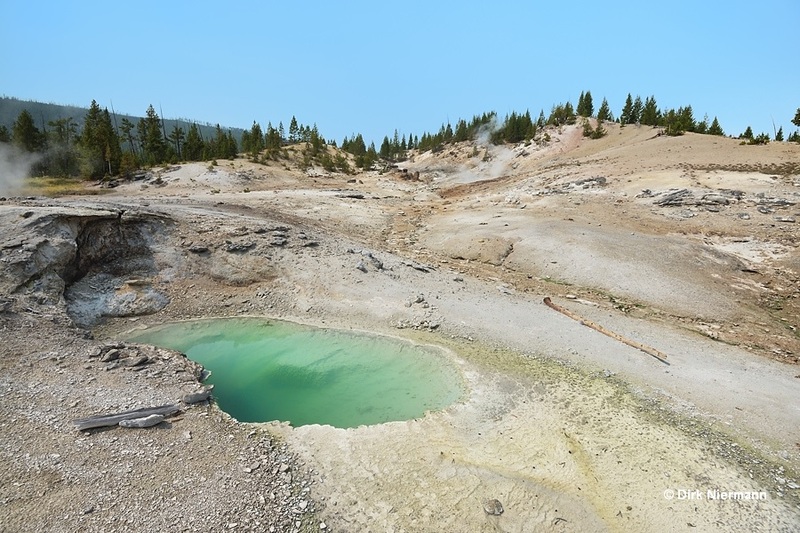 The splashes of the strongly acidic Sylvan Spring may reach up to 1.5 m (5 feet) height. For this one I also found the descriptive but ambiguous name Lobster Claw Spring in a scientific paper, which seems in its literal meaning quite appropriate with respect to the knobby dentation along the edge. The slope west of Sylvan Spring is occupied by some smaller perpetual spouters. Two examples are the extremely fine spraying GSSGNN057 and the cone-shaped GSSGNN059. A widely audible thumping announces the next attractions, which are located 250 m (820 feet) northeast down the ravine. The beats are loud enough already to be heard more than 200 m (660 feet) outside the thermal area. They come from two large mud pots near the northern edge of the field. The first one, designated as GSSGNN027, intermittently pushes out bunches of mud droplets, at one time forming somewhat larger blobs, at another time fine spray. There is also a second vent present, lined with a rust-colored coating just as the first one, which primarily emits steam. The second mud pot lies beyond a small ridge to the northeast. Coffin Spring is slightly larger than GSSGNN027 and even louder. 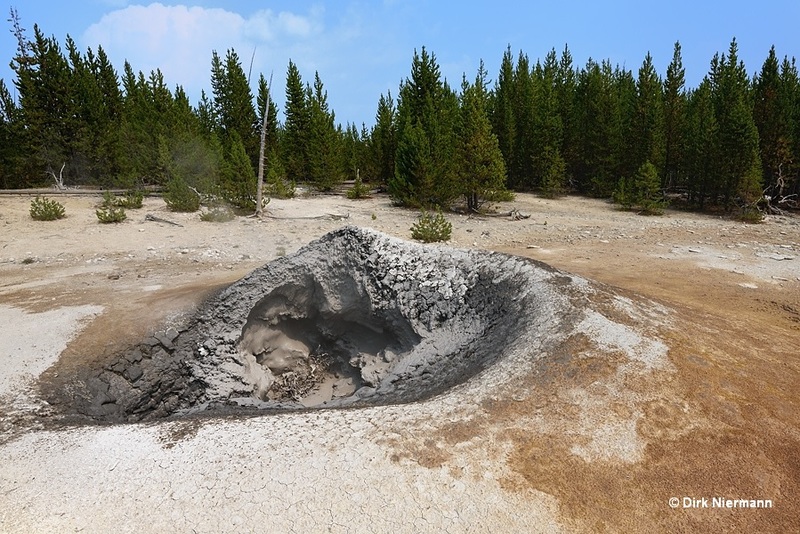 It ejects mud squirts and flakes which often form bizarre eruption patterns. Obviously, the "raised lid of the coffin" grows permanently by adhering mud before it becomes too heavy to support its own weight and a part of the overhang crashes back into the spring. 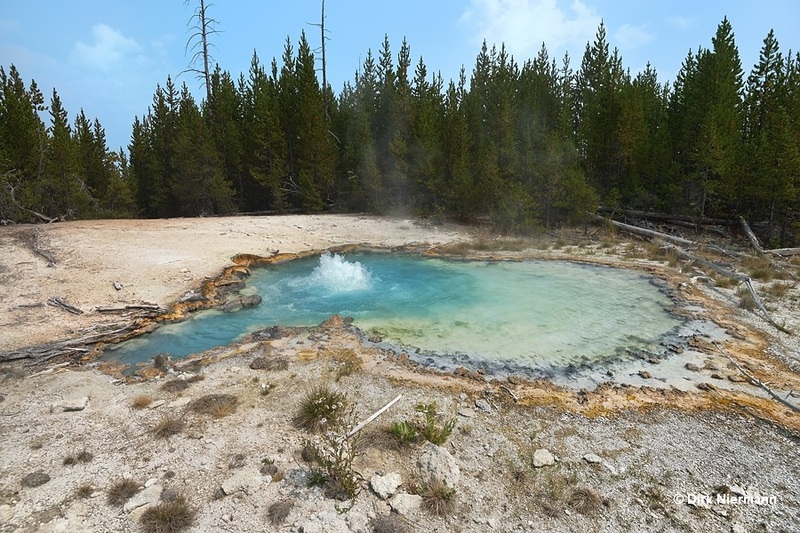 If you follow the northern edge of the thermal area farther east, you come across the perpetually spouting blue pool GSSGNN025. It provides a pleasant contrast to the predominantly muddy gray-brown springs on location. In the east Sylvan Springs Group is passing gently into the Gibbon River meadows. Spring GSSGNN021 was our last stop before we headed back to Monument Geyser Basin trailhead.